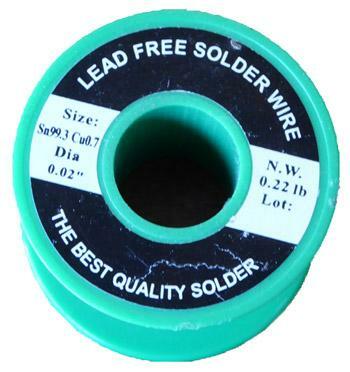 Lead free solder is not as widely used as regular leaded solder. Tin – lead solder works well because it melts at a wide temperature range starting at roughly 360°F. Most tin – lead solder has a 60/40 ratio of 60% tin and 40% lead. It is very common and easy to solder, leaving a good strong bond if soldered correctly. 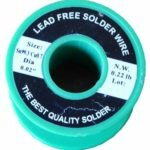 Lead free solder is generally not as well liked as it’s properties are not as well known. Tin-silver-copper is the most common makeup of lead free solder. Lead free solder is harder to solder with as it generally requires a slightly higher temperature to start melting. For beginners it is best to start with tin – lead solder as it is easier to solder. 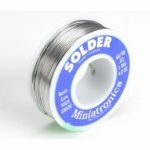 Most solder is tin – lead unless specifically labelled lead free solder. See examples of both kinds of solder below with the lead free solder on the left.